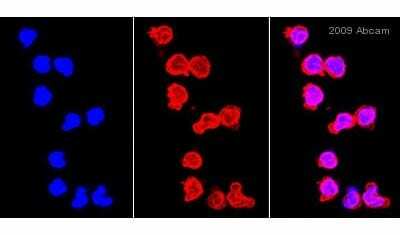 This antibody is specific to IRAK4 and does not cross react with other IRAK proteins. Synthetic peptide corresponding to amino acids at the carboxy terminus end of IRAK-4 (Human). Our Abpromise guarantee covers the use of ab5985 in the following tested applications. ICC/IF: Use at a concentration of 10 µg/ml. WB: Use at a concentration of 1 - 2 µg/ml. Detects a band of approximately 50 kDa. Can be blocked with IRAK4 peptide (448-460) (ab39782). Western blot analysis of IRAK4 in HeLa cell lysate with ab5985 at 1 (lane 1), 2 (lane 2), and 4 (lane 3) µg/ml, respectively. 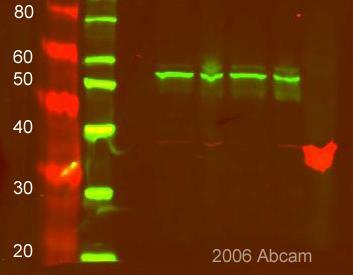 Western blot analysis of IRAK4 in HeLa cell lysate with ab5985 at 1 (lane 1), 2 (lane 2), and 4 (lane 3) µg/ml, respectively. 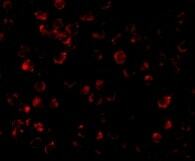 ab5985 at a 1/100 dilution staining IRAK4 in human PMN cells by Immunocytochemistry/ Immunofluorescence incubated for 4 hours at 37°C. Fixed with PFA. Blocked using 2% BSA for 1 hour at 22°C. 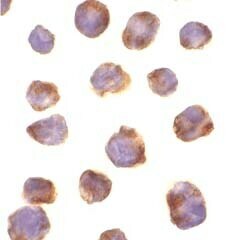 Secondary used at 1/250 polyclonal Goat anti-rabbit conjugated to Alexa Fluor 568. 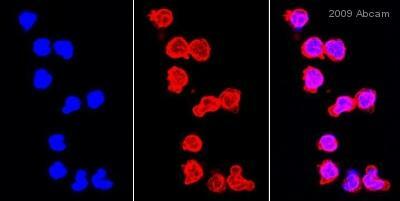 Immunofluorescence of IRAK-4 in K562 cells using ab5985 at 10 ug/ml. Publishing research using ab5985? Please let us know so that we can cite the reference in this datasheet.